Brief exposure to low levels of nicotine not only boosts the brains reward system but also blocks a rival system that limits the duration of such rewards, report University researchers in the March 14 issue of the journal Neuron. The finding helps scientists understand why nicotine addiction takes root so quickly and lasts so long. In 2000, a team from the same laboratory demonstrated how the first exposure to nicotine can create an enduring memory trace, which instills the desire to repeat the experience and amplifies the pleasing effects of subsequent nicotine exposure. The current paper reveals how nicotine prolongs the reward period by disabling the system that counterbalances the drugs pleasant effects. The reinforcing effect of nicotine is the primary reason people cannot quit smoking, despite widespread awareness that smoking causes cancer, heart disease, stroke, emphysema, bronchitis, vascular disease, cataracts and impotence. The World Health Organization attributes four million deaths each year to tobacco use. Unfortunately, drugs of abuse such as nicotine can usurp those pathways, providing the same sort of encouragement for harmful actions such as smoking. McGehee and his colleagues, postdoctoral researchers Huibert Mansvelder and Russel Keith, working with brain tissue from rats, demonstrated how nicotine extends the duration of these rewards. 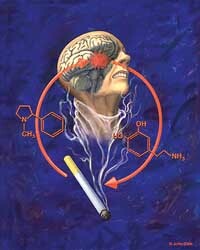 In previous work, McGehees team showed that nicotine produces pleasure by attaching to the nicotinic acetylcholine receptor found on certain nerve cells. In response to nicotine, these nerve cells release a chemical signal called glutamate, which tells connected neurons to release dopamine. The more these nerve cells are excited, the more dopamine is released and the more pleasant the feeling. In this paper, the researchers looked at the effects of nicotine on nerve cells that use a different chemical, called GABA, which inhibits dopamine release. These nerve cells have a slightly different version of the nicotinic acetylcholine receptor. Although they respond to the initial nicotine exposure, these receptors quickly become overwhelmed and lose their power to generate repeated releases of GABA. This renders them unable to reign in the excitation caused by nicotine. They remain disabled for up to an hour. It may also provide a new target for drugs designed to help people stop smoking by interfering with nicotines effects.